With the victory last night, the Padres ensured that the vaunted Vedder Cup stays in its rightful home right here in San Diego. That’s a good thing since Felix Hernandez is pitching this afternoon which could spell disaster for the Padres. Luckily, Andrew Cashner has been busy dressing the deer and actually gives us a shot to match up with King Felix. I expect much beer to be drank at Petco today regardless of the on-field results. By me. In little under 2 hours from now. 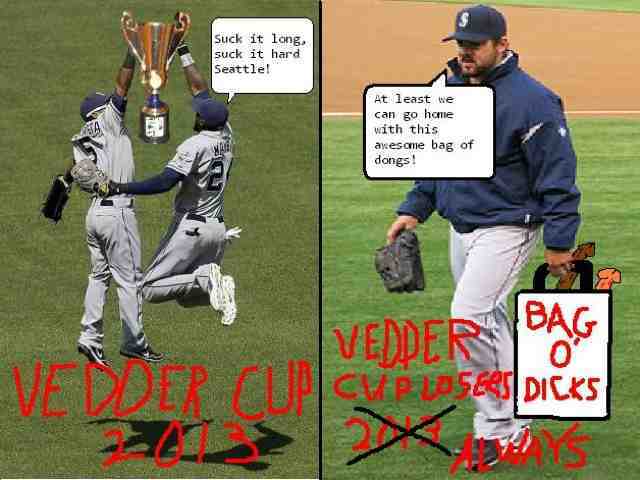 Here is a celebratory, commemorative Vedder Cup 2013 MS Paint work of art to celebrate this great day.